Can we have the following links at the bottom of every question, along with answer, comment, etc. ? It is not enough to make this for the navbar only. Done, using our new PhysicsOverflow theme ! Coool, many thanks :-D ! @polarkernel Thanks. However, I see a bug. It seems that despite the fact that the jQuery is supposed to append the suggested edits button to the bar, the suggested edits button is only appearing for questions, not for answers. 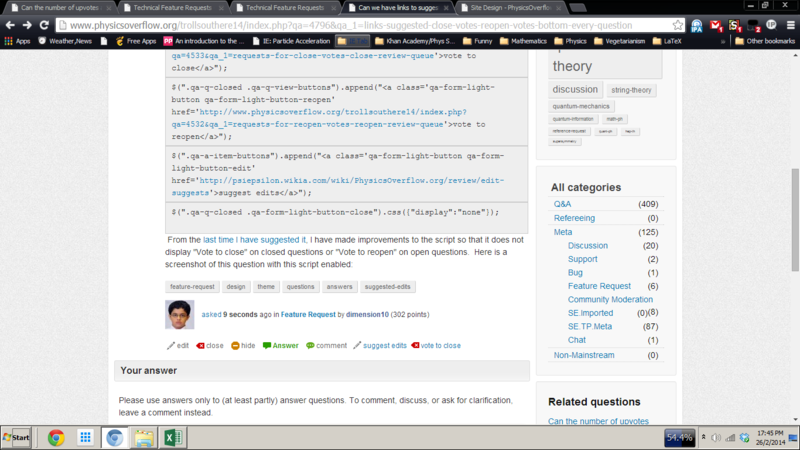 Are you sure you have copied all the lines of code in the question? Fixed. Was so happy that it worked that I did not test the whole code. @polarkernel Thanks, but now the "vote to close" button appears for answers, while only "suggested edits" should.